Strangely yes. I have BT broadband/phone and logged in, went to mobile offers. Cool, thought as much, cheers Dan. I've been with 3 for years now. Best network in my area. It depends on how you build the deal. I use a family sim deal so pay £32 / month for unlimited texts, minutes and 5GB of Data - for FIVE sim plans - so £6.40 per month, then use BT plus for an extra fiver to double the data and you get a mesh network router and disc and a free 4G hotspot if you need it. BT sport thrown in - which I do use and would pay for So there are decent deals, if you spend a bit of time working thorugh it all. Just got this thanks. No idea why this is so cold. 15gb of data for £35 a year...! Hi saad k thanks for the post op firstly. What I wanted to ask was whether you verified that the £5 discount being applied to the monthly price would still apply if the person's bt phone number household you used decided to move from bt. As when I contacted bt they suggested this discount is linked to having bt broadband. Or a bt phone account. Once that is cancelled or removed then the £5 discount will be taken away from your monthly bt mobile contract. ? I have attached a pic. quidco showing for me as £60 did it change ? what make of tablet do you cast from wowbiggy &amp; which version of android? that 40Gb is prob because he's a broadband customer &amp; had his mobi data allowance doubled coz he's on a BT Plus tariff where mob &amp; broadband are "combined" &amp; should his broadband break they post you a 4g router &amp; put temp data allowance unltd til fault fixed.You'v prob seen ad on tv with daughter&amp;dad gaming at his wen breaks.? How did you get BT Sport casting slinki61? BT Sports definitely on your mob not separate or via a bttv package? Can you tether and use as hotspot on BT? Got my BT reward card and JBL speakers for both contracts . Also the TCB paid out. So in the end effectively it cost me £3.5 and £2 per month for two contracts. Great deal Op. Were you able to claim the MasterCard? I understand but with a potential to get the sim only with 12GB monthly data for £2 a month I am ok to take a chance. Have been with BT for a long time and have had both good service and major problems. Yes but it’s BT customer service. Are you already a bt customer? If so are you still in contract? Incorrect. From personal experience Android phone will cast BT SPORT MOBILE to TV via Roku (for instance) via Miracast even if you do not have Broadband... So can WindowsPhone. And you can use BT sport mobile on W10 PC and cast to TV in same way, or by plugging in HDMI cable. Don't know about iOS, may be possible via Apple TV. There is 2 lots of offers one via the red link you mentioned.. There I see a few.. But the purple link "add bt broadband discount" in my pic above shows me and those who have assess to it 100s.. By what I'm gathering it only shows as that to those out of contract. BT mobile LIVE CHAT Sim only offer. 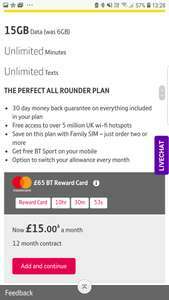 £20 a month for 20GB data, unlimited minutes and texts, BT sport and £75 reward card. Got my reward card and also £70 TopCashback bringing mine down to £15 for the year! 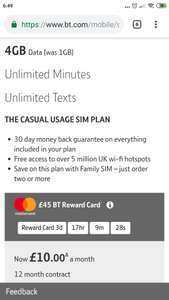 I've been Sim only with BT Mobile for a few years and I always have a conversation a month or so before my contract ends. I usually quote one of the latest alternative deals (often 3 or Virgin). If they don't have a great deal then I ask when is a good time to call back? I'm very friendly and polite ..... and currently have unlimited calls etc and 100gb of data for £20. Oh, and the BT Sport app for free. Clear your cookies then it will show. These tariffs aren’t Extra Speed 4G so only 30Mbps, I think. The Ultimate SIM plan in BLOSSOM143’s post has Extra Speed 4G which gives speeds up to 60Mbps, so equivalent to EE Essentials. Got offered this yesterday but £15pm; 20gb, U/U free BT Sports, with a £80 pre-payed. Took the offer, as it works out as £8.33pm. Hope this helps someone. SIM arrived this morning. Can you not get both? I get 100gb for £20 a month. 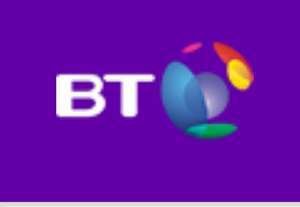 BT Mobile New Customer Deal £15 a month 12m 20gb Data, Ultd Calls & Texts. I just went on chat and they said we don't do deals on here you need to call up? Don't forget, data is DOUBLED if you have BT Plus for your broadband service. See my comment above regards casting. This info is from the t&amp;c they sent me after sign-up. I've got bt sports thru an EE deal,it works well with casting. From the app on my phone to a TV. does this still work if its family sim pack? It's for Plus Broadband accounts. One of the benefits is double data. For ordinary BT fibre accounts there is no double data available. If you click through the Quidco link then there is no mention of the Mastercard, also Quidco won't pay if you participate in any other offer/promotion that is not covered in the retailer Cashback rates. So looks like its one or the other. ...and I had the same problem with o2, had to leave their network. When I got an EE sim I still had my o2 contract, as a 'test' on a 300 mile journey in the UK I kept the phones side by side, o2 kept dropping signal literally every 5-10 minutes and EE never dropped once. So must be you are in the 1% of area that isn't covered by EE. According to reviews if you claim your btreward card then your cashback is declined through Quidco. I have contacted Quidco support for clarification. Will post their answer if they get back in touch. Another person has mentioned this too, I’m getting confused as I’m able to get it to show the BT reward card. I went through Quidco. Although not ordered it. It's the EE network I've recently swaped and it's identical if you use wifi calling it even says you're on EE. I am with' BT since May 2016 ;). I do not have any reasons to ' talk trash '. My printscreens prove what I am saying! If you do not believe me, what are you doing here trolling? 60gb is the most BT mobile do unless your on there new broadband plus service double your standard which could give you a max of 120GB ,OP is talking trash. These are facts. You can 60GB for £18. Can we somehow combine that with Quidco? No casting on the free BT mobile sports app, all other BT Sports packages you can, just not the free one. You can mirror your screen to tv but cannot cast to bt app on Chromecast. So if you get a text from your dad it annoyingly pops up! Some people's deals looks like they're coming from a time machine. Thank you again for your reply. I was hoping not to have to do that. Got a call from BT after signing up with plusnet. Offering me the line rental/ broadband for £21.99. Life would be so much less problematic if they just gave you that in the first place. Instead of making everybody go through the same routine. Then again I suppose it keeps the retention teams employed in businesses! I cam screen mirror bt sport using my lg g5 buy pretty sure casting does not work! thanks for taking the time to answer my question. I have BT line/broadband and mobile and I'm in the process of cancelling broadband with them, that is why I asked. In that case I might as well go the whole hog and cancel the mobile as well! I waited for my contrat to end and also Black Friday as my bill crept up to £51 to try and get a deal with them. For me £40 is not a big enough deal though! Avg speed 36mb. This is more than adequate for many. I have used BT in past and reception has been good for the use. Is it 9 mbits "super fast fibre" that's what they claiming, and with lags everey hour? Or is it something better and serious? I wish BT would just offer simple low pricing rather than having to claim for rebates and free gifts. Dam where did there prices come from i am not a bt customer and for £12 you get unlimited mins/text and a whooping 1gb data with a 12mth contract (mad) I am with three and get 12gb unlimited mins/text for £13mth. just sign up with a new email address and hence BT account number.